The building on the left, Minisink Lodge. West Shore Cottage on the far right, was originally owned by the Racines. 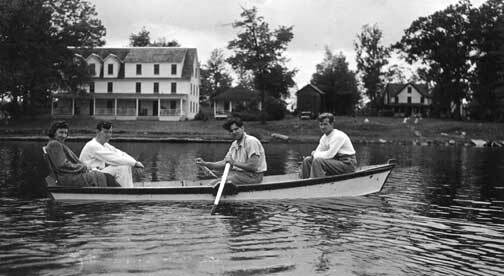 Both Minisink Lodge and West Shore Cottage would become part of Cantwell’s West Shore Lodge. Photo courtesy of Kevin M.
Bornstein’s Grand View Farm. Postcard courtesy of Kevin M.
This entry was posted in Boarding Houses. Bookmark the permalink. There was another boarding house on the Yulan-Eldred Road that I don’t see on your list. 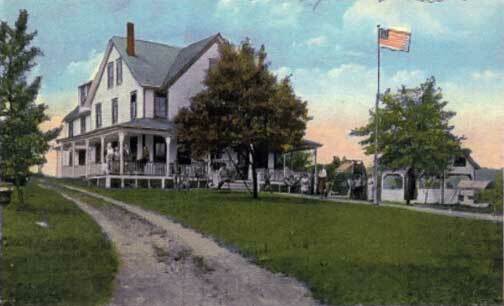 It was called the “Arlington” and was located on the long curve in the road across from Gordon White’s home. It was in the same spot as the late Bill Rupple’s home. Louise: Thank you so much Kevin. My uncle Howard Olsen, called Harry by Mrs. Cantwell, spent many summers at West Shore Lodge in the late 50’s and 60’s. He always stayed in the building near the dining room. Sometimes he would tend bar by the dining room or serve ice cream at the building by the lake. My parents and I also spent vacations there with him. We got to stay in the new building across the street one time but stayed many times in the older buildings. To this day I remember the 3 full meals that were served with a pitcher of cold white milk and some of the most delicious bread. We would walk down the hill to the store hoping that me Dad would drive down and take us back I can still see Mrs. Cantwell sitting by her window on the second floor of the main building. I actually think that she and my uncle, who was a bachelor, were sort of “sweet” on each other! I have great memories of Yulan. My parents aunts and uncles started going to the Highland Hotel in 1950. They used to plan this trip from Brooklyn as if they were going to California. Most people got there on a Saturday or Sunday and they would spend half the day discussing the trip. They continued going there until the early 1970’s. I used to go on weekends and meet my pal John Heckler. We would raise all sorts of cain and go home on Sunday night. I remember Scotty Greenbrger, we used to hang out with him and he worked in Will Brodmerkels’s garage in Eldred. Beer in Spaghetti Joe Consiglios in Barryville was $.10 a glass. It was really great. Practically everyone is gone now including my friend Johnny Heckler who was the best man in our wedding. We went there a few years ago and all the boarding houses were gone. Ate lunch in the Eldred Inn and met someone who remembered the people from those days. On the way back had a beer in Roman’s in Shohola where we used to meet people coming off the train. It was sad but brought back a lot of memories. I have fond memories of the Yulan Hotel. My parents vacationed there in the 1960’s. I worked as a dishwasher during the summer of 1969. The owners, Mr. and Mrs. Bozza, treated all the help like family. I stayed at Tethers, which became Gregory’s “Washington Beach Hotel” with my parents from 1937 when I was a year old until the late 1950’s when I went in the Army. I returned to Yulan in the middle 60’s and the hotel was torn down. Old Walter Tether was a deputy sheriff and ran the hotel until his death in, I think it was 1948. His son Ivan took over for a few years then sold out to the Gregory’s. I heard all the old boarding houses were gone now. I learned to swim in Washington Lake and enjoyed every moment of my youth there. Louise: Thank you so much for your comment! My name is Carol Bozza Zalenski and my parents,Ann and Pete owned the Yulan Hotel for more than twenty years. It was from the 50s thru the mid 70s. My parents were friends with many of the other owners and we have wonderful memories of them and all the guests who returned year after year. My brother and I had so many friends from around “town” we had a great time every summer. When looking through photos I remember what good times all the families had in those boarding house days. Thanks for posting and would love to hear more memories. I had the pleasure of staying as a guest at Cantwells in the late 60s. My Aunt Ethel Cantwell was the owner and I would love to hear other people memories from those days….My Aunt Edna and Uncle Herb owned the Park View Bar. There were different ways that guests could get to the boarding houses during the summers of my youth which ranged from the 1940’s until I was an adult. If you (your family was somewhat affluent you owned a car) and took the sometimes four hour ride in the early forties to the boarding houses from points in New York City. You could take a train (The Erie Railroad) out of Hoboken N.J to Shohola and be picked up by a Wilson Taxi to take you to any boarding house in the area. This trip in its entirety could take six plus hours to complete. You could also take the Shortline bus from Manhattan and get off in Yulan (Four Corners by the post office). Then you could use the pay phone outside the post office and call the boarding house to ask for someone to pick you up. A fourth way and one that I hold close in my memory was to take a limousine from your home to the boarding house of your choice. Now you might think that the mention of a limousine would be something grandiose but it truly wasn’t. The company servicing the area’s boarding houses used rather old limousines (some as old as 10 years) although they were Cadillacs from the thirties and forties. The limousines would pick you up at you home and then go to another home and pick up more people and so on until the car was filled. This meant you drove around the city picking up those who made transportation appointments until the car was filled. (The car held seven riders and their luggage, supposedly no more than two suitcases per person). On the way to the boarding houses the driver would stop at the Red Apple Rest for a bathroom stop and whatever the riders wanted to eat. This stop could take as long as 30 minutes. On the road again to the boarding houses was another two hours and the passengers would be dropped off at their respective boarding houses. The drop off time could take up to an hour as the first stop was usually Eddy Farm and then to the Yulan, Barryville or Highland Lake destinations. Total trip time was usually four hours from the first pick up to the last drop off. The guests though were always there for lunch. To return home the same was done as guests were picked up after lunch and driven from boarding house to boarding house until the car was full and then back to NYC before stopping at the Red Apple Rest again. Usually, the last passenger was home by 6 p.m. The fare for the ride in the forties was $6 each way; while in 1970’s it was $10 plus of course a tip for the driver. In 1951 my family was without a car that summer and my parents hired the limousine, but for us exclusively as we needed the room for our luggage (we were going to stay from August 1 until the day after Labor Day (which we did many years until I was working at a boarding house for the summer). Also, my parents wanted room in the car and not to have to ride around the city picking up others. The cost for this exclusive ride was probably $40 plus a tip. I thought the limousine was beautiful and so grand even though it was probably a 1946 or 1947 model. I thought then that one day I would own one and keep it like new. When I was 38 years old I found one and I still own it. It is a 1947 model and looks the same as my first limousine ride. In 1968 the limousine company that serviced the area had a problem and I wound up owning the company. Four of the boarding house owners petitioned the N.Y. State DOT for me to get a permit to run the service. They came to NYC on my behalf and told the DOT how much they needed to continue to have a reliable transportation service for the area boarding houses. I got the permit, bought three limos and had a great summer business. It was hard work but lots of fun with some great stories from the passengers and about them. Thank you so much for your comment Scotty!! I have photos of our family’s stay at Avery’s Farm on Washington Lake in 1944 and 1945. Does this place exist today? I went to Cantwell’s in the early 70s, and a bit in the later 70s.